Sign Up for our MyOwnArizona Team Arizona Real Estate Newsletter. 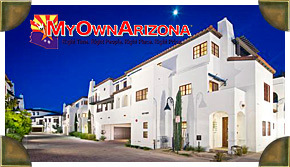 Welcome to the online MyOwnArizona team presentation of Luxury Homes For Sale in McCormick Ranch Scottsdale. Search our collection of the finest Scottsdale luxury homes, estates, and land for sale in the area. The City of Scottsdale has some of the finest luxury homes and estates available in the entire country. The Scottsdale luxury real estate market benefits from one of the largest and fastest growing metropolitan area’s in the entire region. The Scottsdale area boasts plentiful luxury shopping, dining, and outdoor opportunities, which are listed for your convenience in our Scottsdale Luxury Resource Guide. Please contact us to receive the luxury packet on Mc Cormick Ranch Scottsdale. McCormick Ranch was Scottsdale's original, and possibly best, master-planned community. In 1972, Mc Cormick Ranch was developed in stages to become what it is known for today. Known for two magnificent championship 18-hole golf courses - McCormick Ranch Golf Club's Palm Course and Pine Course - with over 25 miles of bicycle pathways, parks, tennis courts, 130 acres of lakes with seven lakes in all, it is the plush landscape which makes it well-known. Mc Cormick Ranch in Scottsdale, AZ Golf Homes for Sale are attracting Arizona home buyers internationally. Our McCormick Ranch of Scottsdale AZ properties search is available at the link below. Mc Cormick Ranch Scottsdale AZ residents enjoy the local attractions including Camelback Mountain and Boyce Thompson Arboretum. A home in McCormick Ranch in Scottsdale, AZ is close to all the city events especially thanks to a modern system of highways and a new transit system. With plenty of Scottsdale Arizona sun you are ensured that your time will be spent doing enjoyable activities in and around Mc Cormick Ranch of Scottsdale, AZ. Your home in the Valley of the Sun is waiting. Beautiful luxury developments and communities abound within the areas of Scottsdale. In the heart of downtown Scottsdale you will find urban and upscale lofts with views to take your breath away, and in the surrounding communities in Scottsdale you will find truly amazing luxury estates. Luxury homes are abundant throughout our area, and MyOwnArizona's Scottsdale Luxury Homes division has the resources you need to find your dream home. This online resource of Luxury Home offers our clients the best of all luxury to be found in this wonderful area we call home. Your Scottsdale MyOwnArizona team is the top Arizona realtor group serving the Scottsdale AZ luxury area in the industry. Let our MyOwnArizona business professionals be of assistance to you and your needs. 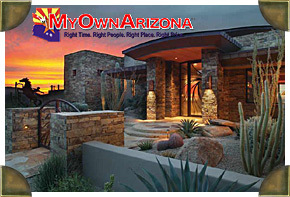 Contact us at: info@MyOwnArizona.com for Arizona real estate. © Copyright 1995-2014. OwnArizona LLC. Phoenix AZ Real Estate. Scottsdale AZ Real Estate. All Rights Reserved.